For the fourth installment in our series on native shrubs that are beneficial to wildlife, I’ve chosen one that appropriate to the season, provides some nice fall color to our forests. Now I’ve met more than a few woodland owners who are not fans of vine maple; it’s not a favorite of those who prefer a tidy or parklike forest. Working or wandering in mature forests you’ve probably tripped over it or crawled under it and possibly cursed it under your breath. 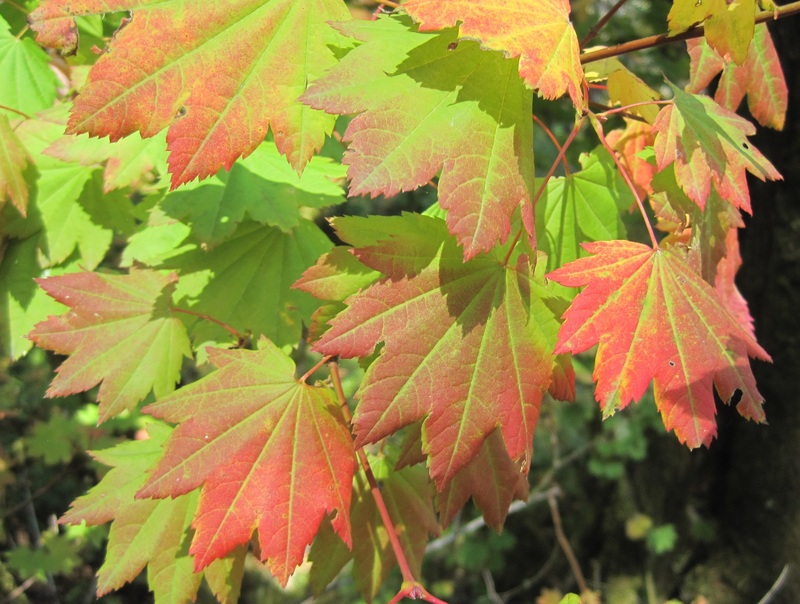 Nevertheless, vine maple is another of those “brush” species that benefits wildlife in numerous ways. 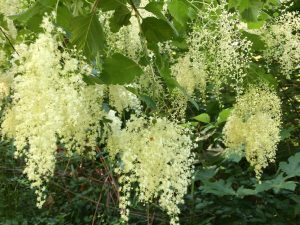 With some tolerance for its rambling ways you can find a place for this species to provide that service on your woodland in concert with your other land management goals. If you are interested in enhancing wildlife habitat on your property, read on for our species profile. Posted in forest management, wildlife. If one of your land management goals is to provide wildlife habitat, you’ll want to consider keeping a mix of native shrub species on your property. 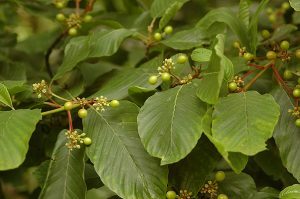 Shrubs provide a host of services to wildlife, including shelter or cover, nesting space, and food from their twigs, leaves, flowers, and fruit. With thought given to species selection and location, retaining existing shrubs or planting them can benefit wildlife without compromising timber growth or forest operations. This is the third article in our Shrubs for Wildlife series (see others here and here). Each article highlights one species that benefits wildlife in northwest Oregon forests. If one of your land management goals is to provide wildlife habitat, you’ll want to consider keeping a mix of native shrub species on your property. Shrubs provide a host of services to wildlife, including shelter or cover, nesting space, and food from their twigs, leaves, flowers, and fruit. With thought given to species selection and location, retaining existing shrubs or planting them can benefit wildlife without compromising timber growth or forest operations. 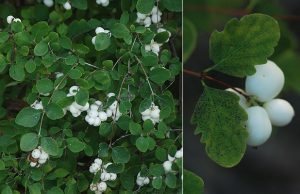 This is the second article in our Shrubs for Wildlife series (first is here). 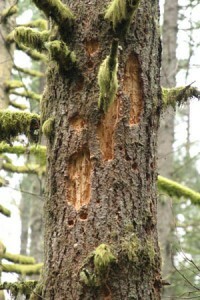 Each article will highlight one species that benefits wildlife in northwest Oregon forests. If one of your land management goals is to provide wildlife habitat, you’ll want to consider keeping a mix of native shrub species on your property. Shrubs provide a host of services to wildlife, including shelter or cover, nesting space, and food from their twigs, leaves, flowers, and fruit. With thought given to species selection and location, retaining existing shrubs or planting them can benefit wildlife without compromising timber growth or forest operations. This is the first article in a series intended to help you recognize some of the “brush” species that may exist on your property, and understand how they may fit with your management goals. Each article will highlight one species that benefits wildlife in northwest Oregon forests. I often try to write stories that make a connection between the birds you find in a place and the habitat conditions there. Because habitat is something we can create or alter by our forest practices, this illustrates an opportunity for interested landowners to manage their properties to improve woodland habitat conditions for particular birds. While we focus on birds, it is an illustration that applies to all woodland fauna. Animals tend to be quite responsive to habitat conditions. Birds are fun, abundant and easy to observe by watching and listening, which makes them a good group of animals for landowners to key in on. In fact, lots of what we know about birds, and how they use different places (migratory arrivals and departure, where the feed and nest) has been gained through careful observation. I recently was at a conference on “Wildlife in Managed Forests” sponsored by the Oregon Society of American Foresters and the Oregon chapter of The Wildlife Society. Speakers discussed current research on wildlife damage and wildlife habitat enhancement projects across western Oregon and Washington. There was far too much interesting stuff for this short article, so in this post I will focus on one recurring theme of the meeting. It’s one of the easiest and most effective ways to maintain a wildlife-friendly forest: retaining dead wood as snags (standing dead trees) or downed wood (on the ground). I’ll return to some other topics later. Nearly 100 species of animals in Oregon (mostly birds) use snags. First, birds such as woodpeckers forage on insects living in these trees and then excavate cavities in them for nesting. Later, these cavities are used by other bird and mammals for nesting and shelter. Raptors such as hawks may also use snags as perches, from which they can prey on voles or other mammals that might damage seedlings. Just a few days after the workshop, I was out visiting with a landowner near Rainier. A small harvest had just been completed, and the logger had left a big, defective log alongside the unit (shown in photo below). The owner wondered, could it have been sold as a pulp log? Should she see if someone wanted it for firewood? I suggested that the log was already providing value, and probably more than what might have ended up in her wallet from these potential uses. 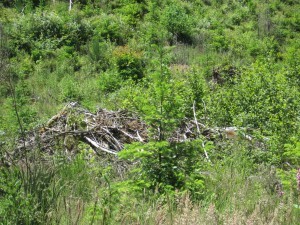 Downed wood is used for cover, travel corridors, breeding spaces, and are especially important for amphibians such as newts. The naturally regenerated alder in the background had come in after a harvest that had left little to no wood on the ground. The foreground will soon be planted back to conifers, which will take decades to reach a size that will provide a new source of snags or downed wood. 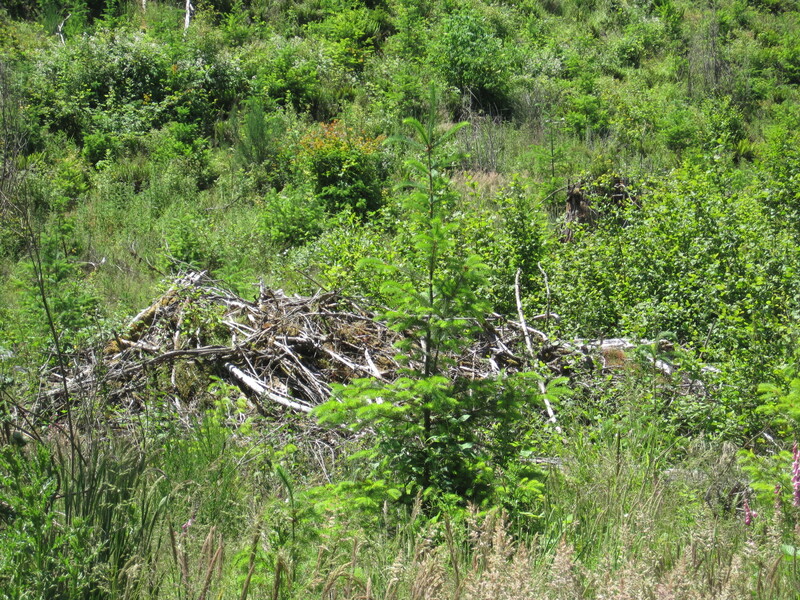 By carrying over some downed wood like the log in the photo from one forest generation to the next, you can ensure some continuity of these wildlife-friendly habitat elements. 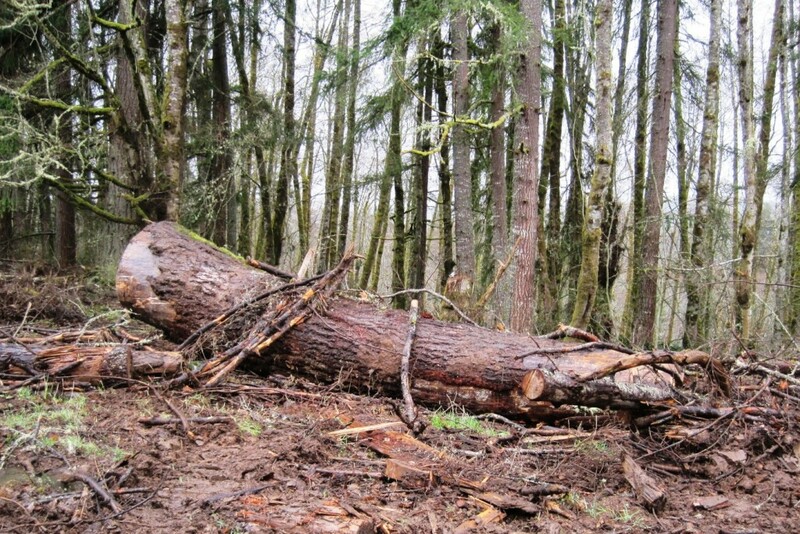 Consider not disturbing down logs that are already in your forest – they are playing an important role, and besides, your equipment may take a beating if you try to move them or run them over! Have you created or left snags or downed wood on your property? Do you have evidence of wildlife using these structures? I would like to create a photo gallery. Send me a photo of dead wood in your forest with a description of how it came to be or who you think is using it. If I get enough responses, I’ll share them all in a future article. For more information on managing for wildlife, check out “Wildlife in Managed Forests: Oregon Forests as Habitat” published by the Oregon Forest Resources Institute. You can find it and many other publications about forest wildlife at KnowYourForest.org. Oregon Forest Resources Institute is sponsoring a “Bat Chat”, Saturday May 5th at 1 pm at the World Forestry Center in Portland. The speakers will feature how wildlife biologists, researchers and land managers can work together to leave and create bat habitat on the landscape. 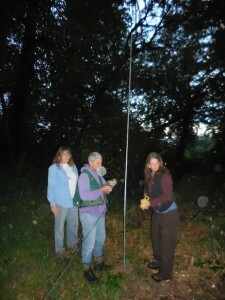 Of interest to those interested in enhancing bat habitat on their land and to bat lovers in general. Click here for the details. The Oregon Women Owning Woodlands Network has a full schedule of events coming up including a couple locally. These programs are a great way to meet other land owners and get tips for your own property, all in a friendly and informal setting. To learn more about WOWnet, visit the Facebook page. To RSVP for any of the events listed below, contact Anne Walton at anne_zenafarms@yahoo.com. See the work done by these landowners in building walking and access trails throughout their property. Jerri O’Brien, Master Woodland Manager, Benton County, will share her training and tools in trail building as well. Take a hike with Luke through the beautiful property at Left Coast Cellars and see their sustainable management practices in action, their oak savanna restoration area, plus their unique trials in growing the European Black truffle. Enjoy additional information and a delicious lunch/tasting, with the chance to network with our group in their lovely cafe. We filled this tour in February so are offering it again! Husbands and friends are welcome. Make a day of visiting the beautiful Eola-Amity Hills area. $15/lunch/tasting flight offered. We will gather in the cabin at Hyla Woods to learn what a cruise report tells you about your timber. We will tour the property to compare what is in a cruise report to what you see on the ground. This is a follow up field trip to our January class. Posted in events, forest management, wildlife.